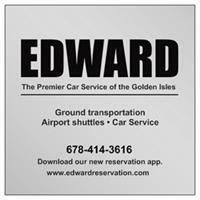 EDWARD will pay anyone two percent on every new passenger you refer to us for as long as we own the company and as long as you remain active on our customer rolls. To qualify just download our app at www.EDWARDReservation.com register as a customer invite two family members or friends to do the same. Once you and they take two rides each you will begin earning two percent on every ride everyone of your referrals registers. The more they ride the more you earn. If you are interested in learning more about this program email us at EDWARDTransportationandMedia@GMail.com In the Subject Put 2 for 2 Glynn County Chamber. Make sure you have registered as a new Customer. When you refer a friend have them register and then have them email us with your name plus 2 for 2. We are considered a Ride-Share Company because we reservations are made on line and our drivers operate on a Ride-Share APP. For their Ride-Share Insurance to be valid all rides have to be entered into our Reservation System. There are three ways to do this. 1. First and best is through the NEW passenger app. 2. Online on our reservation page. 3. Text your full name and email address along with your cell number to 678-414-3616 and the pick up address and drop off address. If either is an airport provide the Airport Name and the Airline and Flight #.